Rock candy lollipops or swizzle sticks in fun assortment of blue raspberry, cherry, cotton candy, grape, strawberry, and watermelon. Stick top to bottom is approx. 5.5 inches. Candy portion is approx. 2.5 inches. 8 sticks per bag. Color assortment will vary depending on availability. The candy was just as I remembered as a kid and my kids loved them!! My kids loved the rock candy!! 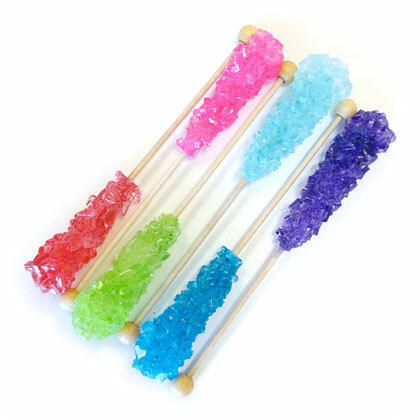 The rock candy shipped very quickly and made it in plenty of time. My geology class loved it.